Buying an apartment in Adelaide might offer a “hassle-free” lifestyle, but expect to lose a lot of money when you go to sell it, a property investment expert has warned. People who bought apartments in three Adelaide developments about a decade ago made huge losses when they sold them, new data shows. Those who bought apartments at 185 Morphett Street in the CBD, Liberty Towers at Glenelg or Newport Quays in Port Adelaide about a decade ago lost an average $166,000 when they eventually sold them again, according to CoreLogic data provided to InDaily by Property Investment Professionals of Australia chair Peter Koulizos. 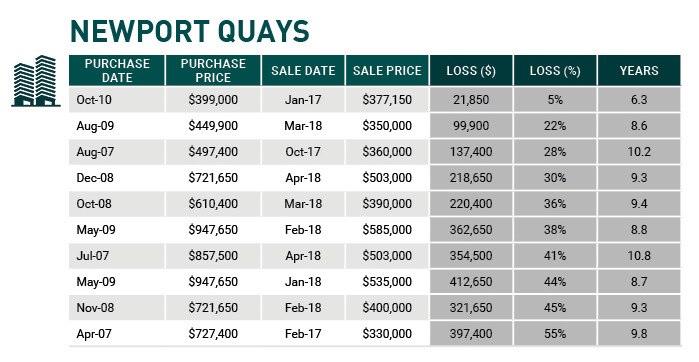 At the most extreme end of the losses, one buyer spent $947,650 on a Newport Quays apartment in May 2009, only to sell it early this year for $535,000 – a loss of more than $400,000. 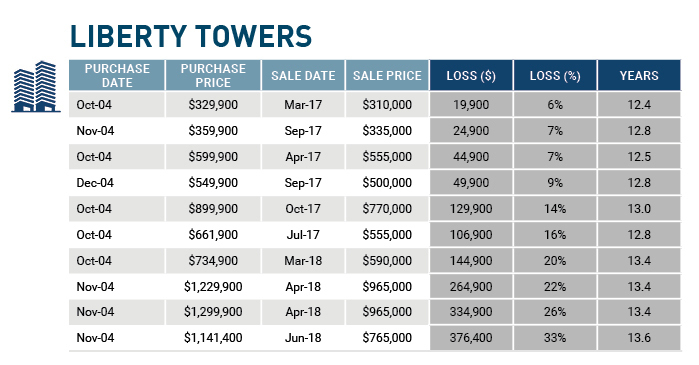 The most modest of the losses was $19,900, on a Liberty Towers apartment purchased for $329,900 in 2004 and sold early last year. Koulizos said that although huge losses like those made on apartments within the troubled Newport Quays development were rare, buyers in Adelaide should generally expect to sell apartments for less than they bought them for. “Apartments are good for people who want to live in them, and want a hassle-free lifestyle,” he said. “(But) I don’t like apartments as an investment. Data: CoreLogic / Peter Koulizos. Koulizos said the majority of apartments depreciate over time because most of their value is in the physical building, which depreciates. By contrast, the price of houses appreciates over time because most of their value lies in the land, which increases in value. Koulizos said apartments tend only to gain value once the building is fully depreciated and the land becomes the more important element of the sale price. “In 40 years’ time, you’ll sell it for what you paid for it,” he told InDaily. A report on Adelaide’s apartment market by JLL Research, published in August this year, found that apartment prices and rents have “grown strongly in recent times, compared to the detached housing market”. The report said the median price of an apartment in Adelaide had risen by 5.6 per cent, to $380,000 over the year to March 2018. However, Koulizos said the average price of apartments in Adelaide was only growing overall because the price of newly-built apartments was growing. “They’re making them bigger, and (giving them) higher quality finishes,” he said. “The prices of new apartments are going up. Property Council SA executive director Daniel Gannon argued that the data on Newport Quays, Liberty Towers and 185 Morphett Street was only indicative of those specific projects. …any suggestion that Adelaide’s apartment market is a risk based on hand-picked case studies is base fearmongering. He cited CoreLogic data for the June quarter of 2018, that 90 per cent of “units” – a category which includes apartments – resold at a profit in Adelaide. “In the June 2018 quarter, more than 92 per cent of houses across Adelaide resold at a profit compared to almost 90 per cent of apartments, which is favourable against the national average,” he said. “With this data in mind, any suggestion that Adelaide’s apartment market is a risk based on hand-picked case studies is base fearmongering. Adelaide City Council associate director of economic development and tourism Matt Grant told InDaily he could not comment on Koulizos’s assessment that apartments in Adelaide generally depreciate. “Occupied apartments add value to the city economy and community, and will always be the preferred outcome we push for,” he said. “City of Adelaide has a focus on growing visitors to the city, businesses in the city and residents in the city. Grant said Adelaide was currently at the top of an ‘expansion phase’ in the apartments market. “Apartment market activity indicates supply side approval phase has been strong and construction stage is at a height heading into a sustained period – 2 years – of apartments completion for occupation,” he said..
“The JLL Report states that Adelaide is at the top of the expansion phase – accelerating growth and long term average growth – behind Canberra and Melbourne. InDaily contacted the Real Estate Institute of South Australia and Newport Quays developer Multiplex for this story, but we did not hear back before publication.